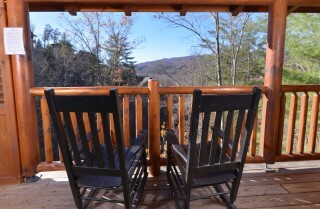 You can’t go wrong planning a family vacation to the Smokies. 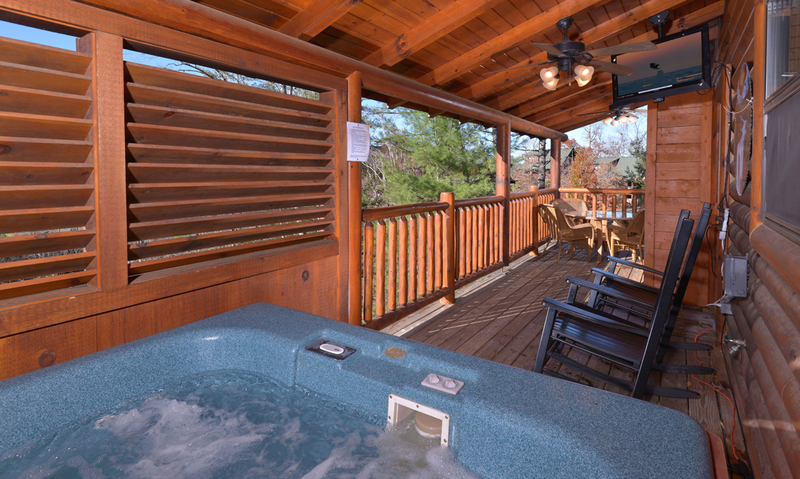 Family-friendly events and attractions line the streets of Pigeon Forge all year long. 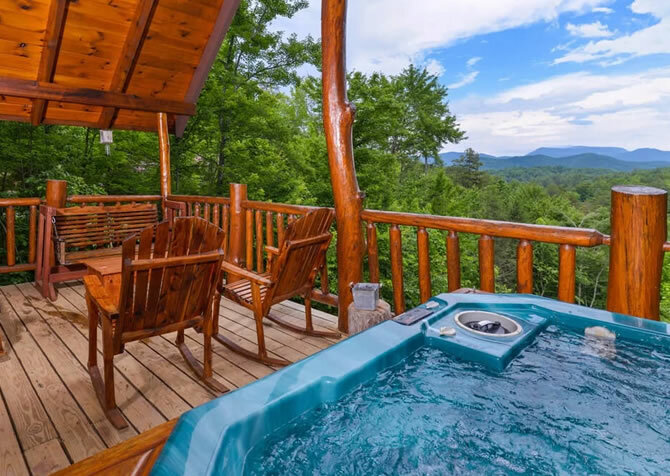 Combine that with the surrounding natural beauty of the Great Smoky Mountains, and you’re in for a vacation experience like you’ve never had before. But one of the most important details for your family’s getaway is choosing the right place to stay. 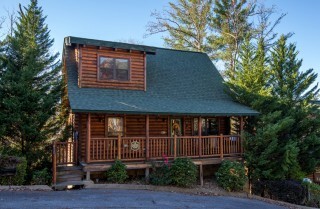 Less than 5 miles outside of downtown Pigeon Forge, a family-friendly cabin waits for you in the Covered Bridge Resort. 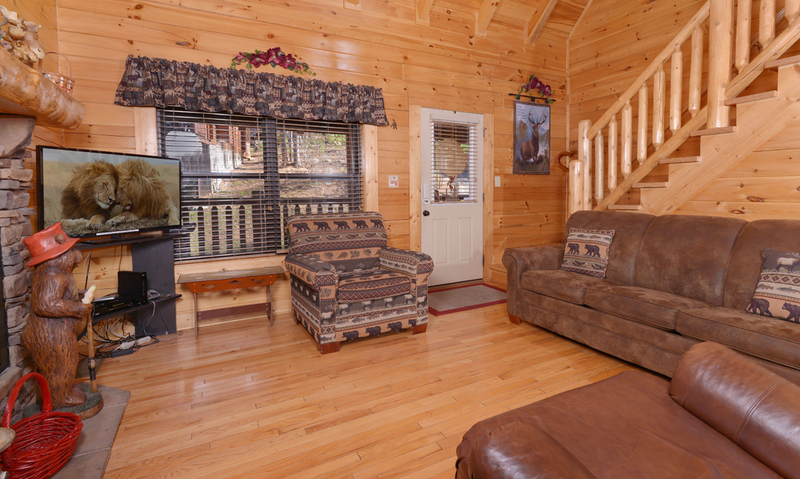 Dancing with the Stars is a 2-bedroom, 2-bath cabin that comfortably sleeps 9. 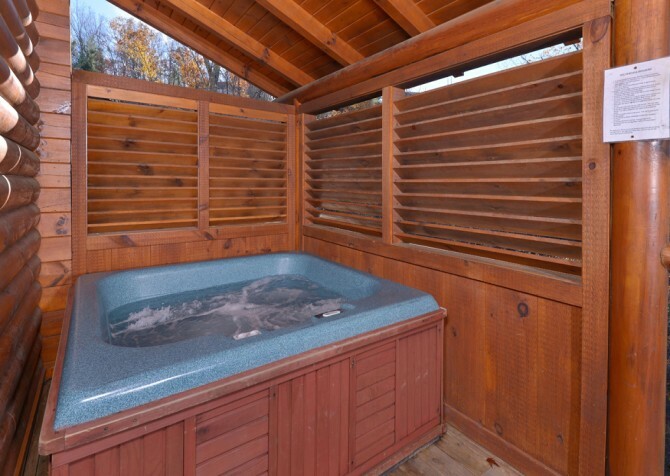 Take advantage of the multifunctional rec room, covered deck with an outdoor hot tub and rocking chairs, community pool access, and wooded mountain view offered by Dancing with the Stars. A charming mountain façade gives way to a warm and cozy interior when you enter Dancing with the Stars. 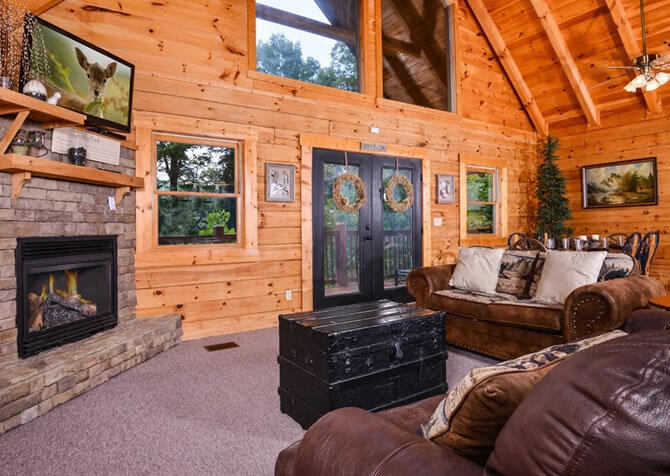 The open design of this cabin’s living room provides a large space for your family or small group to relax after exploring the sights of Pigeon Forge. You’ll have multiple options for seating, including a leather recliner, a large suede couch, and a coordinating plush chair. 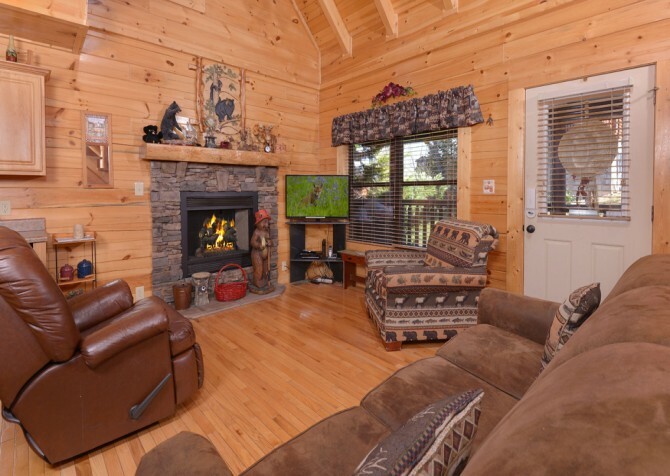 All of these point toward the large flatscreen TV in the corner of the living room, where your group can gather on cold mountain evenings or rainy summer afternoons. 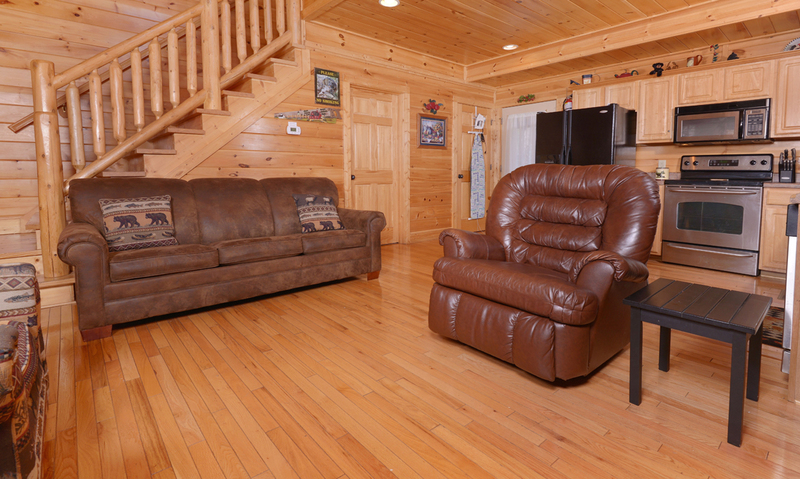 Use any downtime during your vacation to catch up on favorite TV shows or watch a favorite DVD using the cabin’s DVD player. 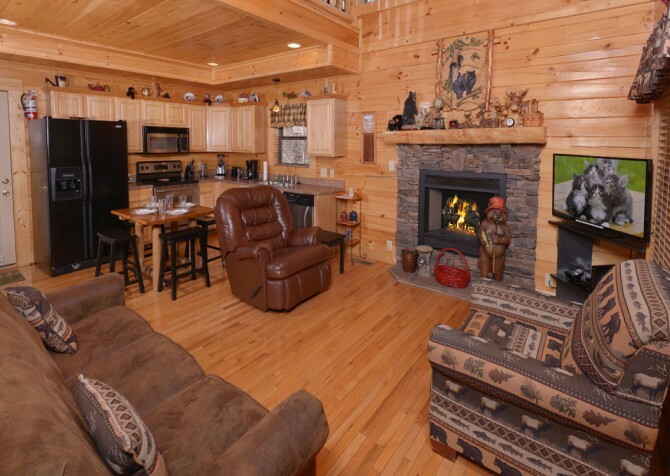 Or just enjoy each other’s company around the electric fireplace that’s at the heart of the Dancing with the Stars’ living room. The fireplace (non heating) is surrounded by beautiful stonework and offers the perfect place to relax as a family. 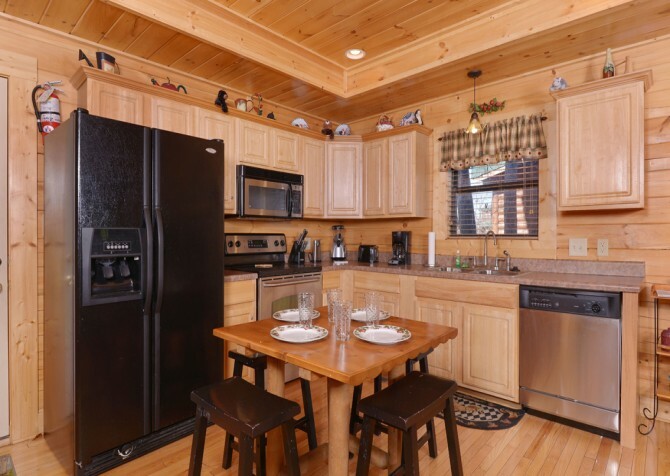 The updated kitchen of Dancing with the Stars is all you’ll need for your family’s getaway. With all your major appliances in black and stainless steel, you’ll cook in luxury at this Pigeon Forge cabin. Enjoy small countertop appliances as well, like an electric can opener, toaster, blender, and coffeemaker in Dancing with the Stars. You should find everything you need for home-cooked meals while you’re away, which is a great way to stay within your budget and still have a great time in Pigeon Forge. 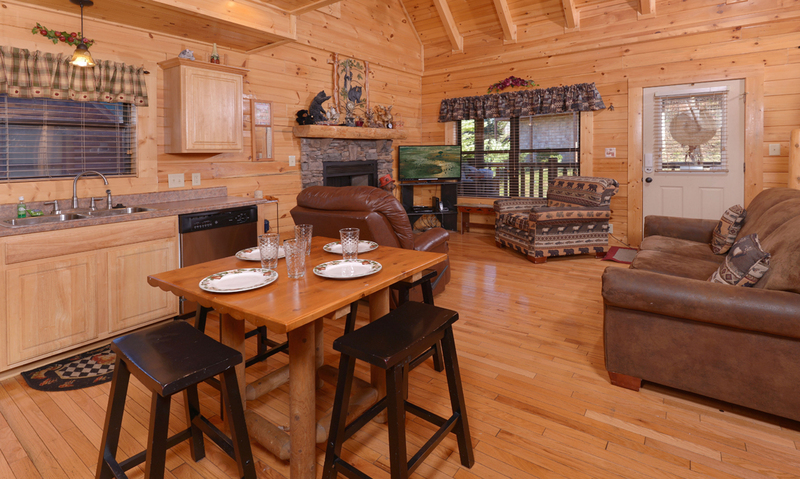 Even if you don’t feel like cooking during your stay at Dancing with the Stars, you can always try our in-cabin catering option or any other of our Vacation Packages that appeal to you. 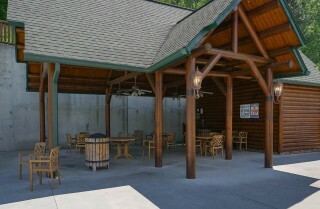 Enjoy fresh-made meals and Smoky Mountain–themed gift baskets without having to lift a finger while you’re away! Just off from the kitchen is a modern bistro table with 4 stools and a place setting for 4. 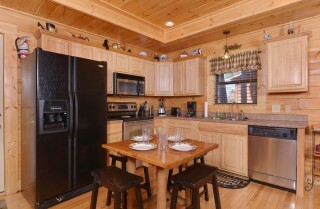 Enjoy your home-cooked meals together at the table for a much-needed change from your busy lifestyle at home. 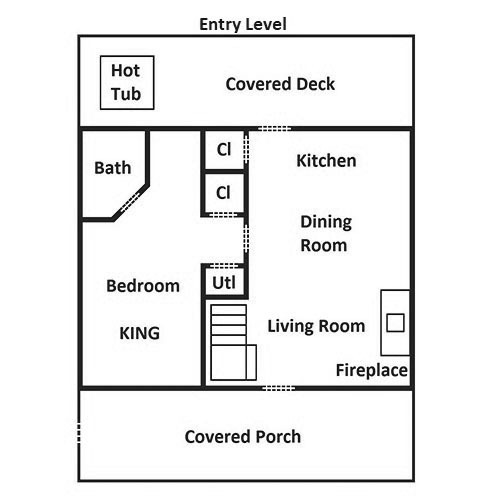 Although the table has room only for 4, you can still eat together—with a few of you in the living room—thanks to the open-concept design of Dancing with the Stars. Enjoy homemade meals, a selection of snacks or desserts, or just a cup of coffee together at this dining table. And when you’re done eating, this table also functions as a perfect place for game night in the cabin. 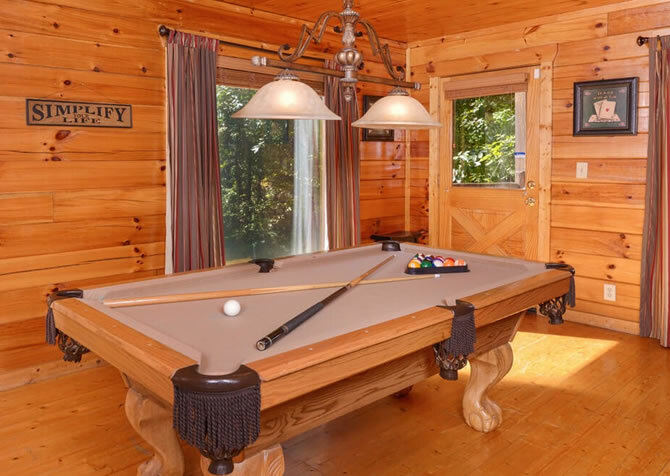 Bring your favorite board games and plan for some friendly competition during your Pigeon Forge stay. Upstairs in the loft, you’ll find a multifunctional rec room that’s perfect for kids or fun-loving adults who are traveling with you to the Smokies. 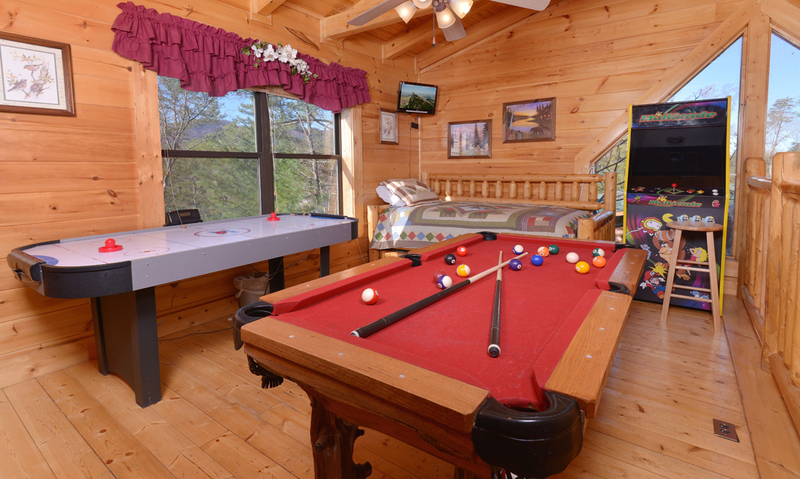 The rec space of Dancing with the Stars comes with a variety of places to play, including a pool table, air hockey table, and a multicade machine. You’ll also find a twin trundle bed with a mounted flatscreen TV in the corner. 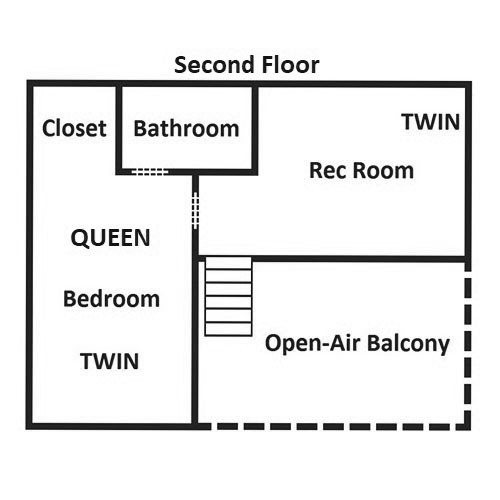 Use this as a couch during the day and an extra bed at night. No matter how you use the Dancing with the Stars rec room, you can enjoy the incredible views this space has to offer. 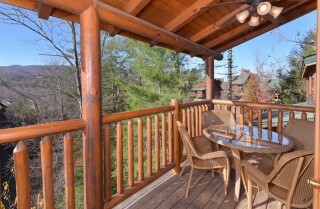 Several large windows surround the rec room, providing incredible views that overlook the wooded Smoky Mountains. 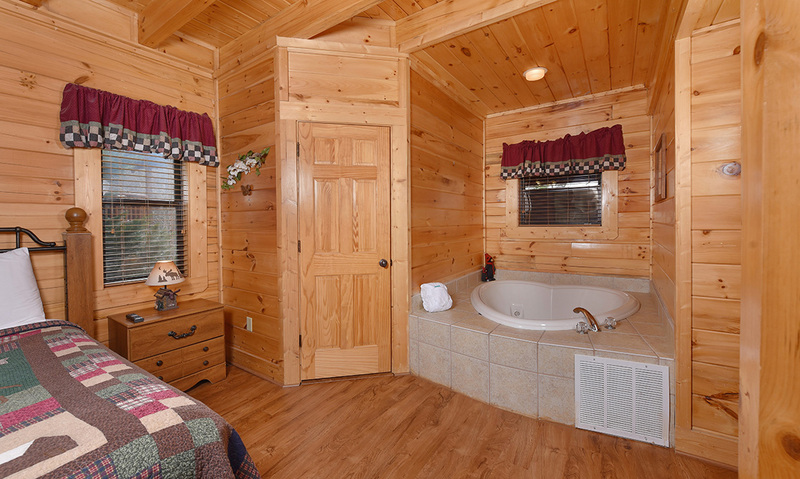 Dancing with the Stars comes with 2 bedrooms and 2 bathrooms, providing enough sleeping space for up to 9 guests. 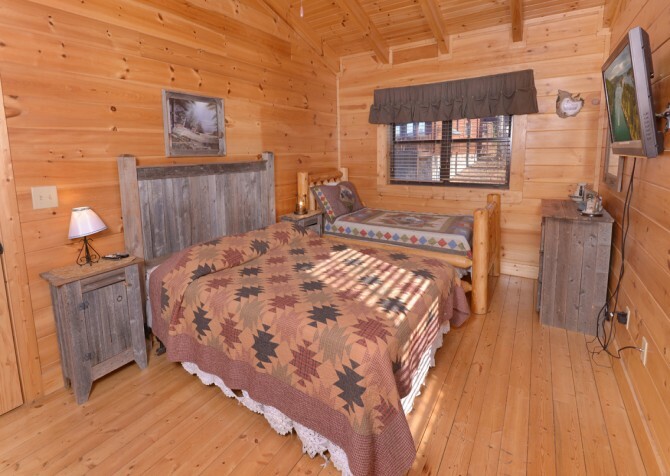 The first bedroom of this cabin features a king-size bed, chest of drawers, bureau, nightstand, ceiling fan, reading lamps, and a flatscreen TV. You’ll also find a heart-shaped indoor jetted tub in this room, making it a romantic space for those celebrating a special occasion on their Pigeon Forge getaway. 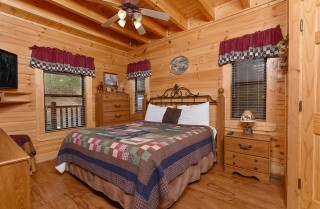 The second bedroom also has a king-size bed along with a twin bed beside it. Enjoy much of the same furniture pieces that are found in the first bedroom, including a mounted flatscreen TV. 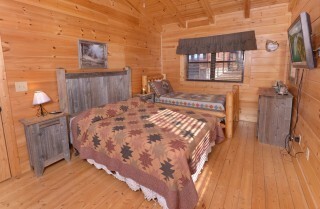 Besides these beds and the twin trundle in the loft, you’ll also find a queen sleeper inside Dancing with the Stars. This cabin provides multiple options for families, couples, and small groups traveling to Pigeon Forge. To experience the beauty of the wooded mountain view that comes with Dancing with the Stars, be sure to spend some time in this cabin’s outdoor spaces. You’ll find everything you need for a relaxing time on the porch, including rocking chairs, an outdoor ceiling fan, and an outdoor dining table with 4 chairs. Spend mornings with a cup of coffee on the back porch soaking in the sights and sounds of the Smokies. Or spend the evening with a home-cooked meal straight off your charcoal grill, which is available to you to use during your stay at Dancing with the Stars. 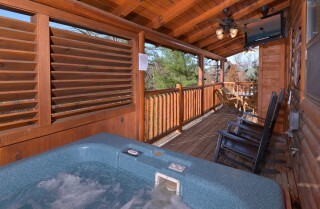 Best of all, plan for relaxing nights with friends and family in your screened-in outdoor hot tub. 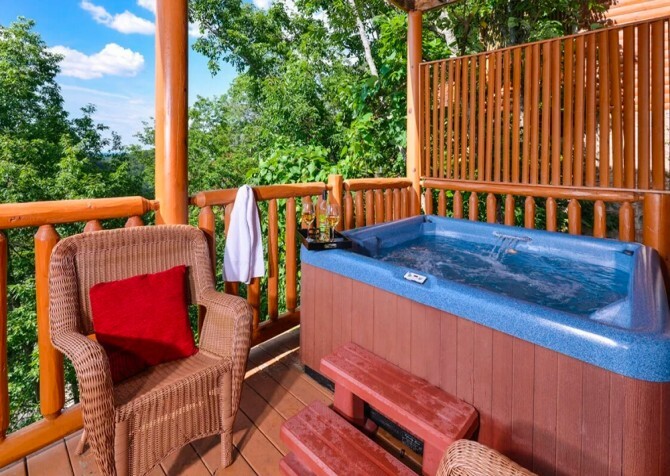 This hot tub even comes with its own TV! 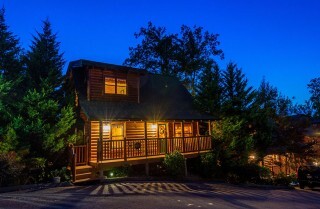 The possibilities for outdoor fun never end at Dancing with the Stars! 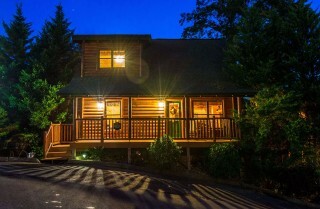 For most of us, Internet access is a must, even when we’re on vacation. Whether you need to check your email for work or just check up on local events in Pigeon Forge, we want to make sure you have everything you need during your stay. So Dancing with the Stars comes equipped with free Wi-Fi access that you are welcome to use while you’re away. Other helpful amenities include a washer and dryer—something you’ll be thankful for after long days of hiking in the Great Smoky Mountains National Park. 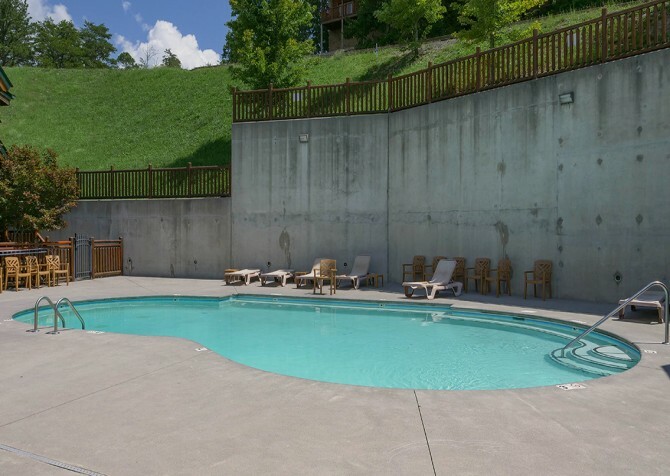 Plus, have fun at the community pool in summer! 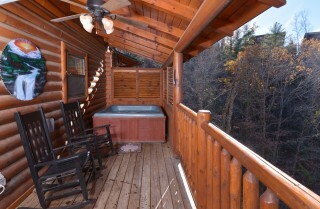 Ride the Great Smoky Mountain Wheel. Try a delicious, home-cooked meal at Paula Deen’s Family Kitchen. Shop for authentic Tennessee flavor at Ole Smoky Moonshine. 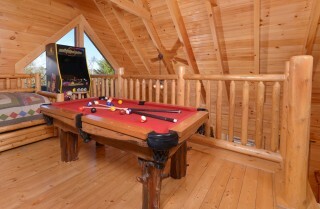 You can do all this and more at The Island! 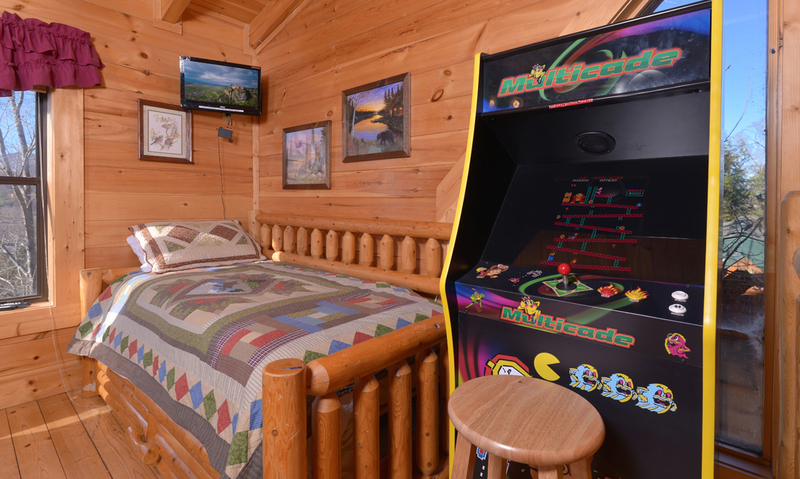 With mini golf, bumper boats, an indoor rock climbing wall, a huge arcade, and 8 go-kart tracks, the NASCAR Speedpark provides a heart-pounding good time in the Smokies. Ask about their Unlimited Ride wristbands for a full day of fun! What makes Dollywood special is more than its world-class entertainment and high-octane roller coasters. 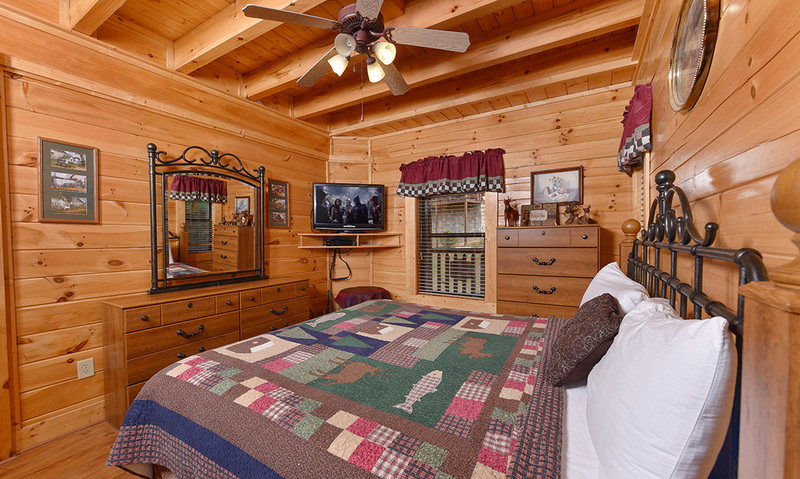 At Dollywood, you’ll also get to experience the spirit of the Smokies with Tennessee music, food, and charm found throughout this premier amusement park. "This is a nice cabin and we enjoyed our time here, but you should confirm with Cabins for You that insects have been treated. I killed 7 wasps in the unit. 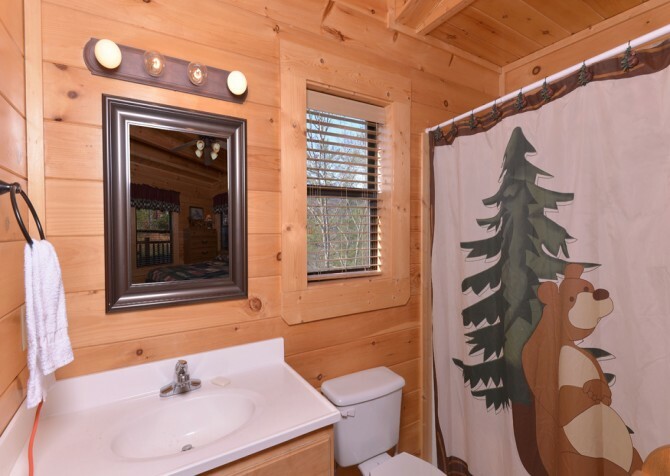 I know these are the mountains and I'm used to dealing with insects, but…"
"This is a nice cabin and we enjoyed our time here, but you should confirm with Cabins for You that insects have been treated. I killed 7 wasps in the unit. I know these are the mountains and I'm used to dealing with insects, but 7 wasps indicate nesting. Again, we really like the cabin but be sure it has been treated and sealed to prevent insect entry. I saw some daylight around beams that extend to the eaves. I wanted to leave this review, not to speak poorly on the cabin, but to inform people in case someone is allergic to stings. The cabin itself is nice and conveniently located." We are so glad you enjoyed your time at this cabin and completely understand your concerns about the wasps and the safety of future guests. We are most grateful you reported this. We will have the cabin inspected for a potential nest as well as check the cabin for areas that need resealing. 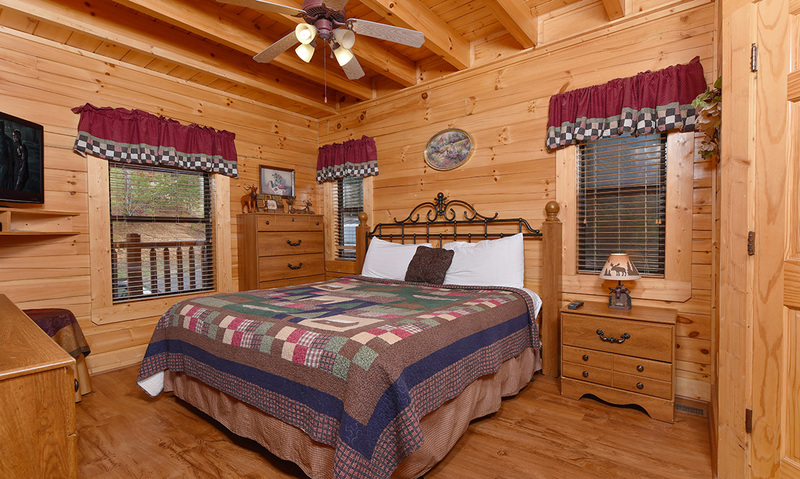 Rest assured all our cabins are treated with pest control monthly. Despite these pest issues, we are glad to hear you enjoyed the cabin and its convenient location during your Great Smoky Mountain stay. We look forward to serving you in the future!